Six fragments of medium mammal bone were recovered from two features at the Deerfield Academy Site. Feature 10, a Contact Period Native pit feature, yielded five medium mammal longbone fragments . Feature 20, a possible 18th century structural post hole, contained one fragment of calcined medium mammal flatbone. The cattle bone from the site likely dates to the nineteenth century or later, due to the presence of machine saw marks on the bone. 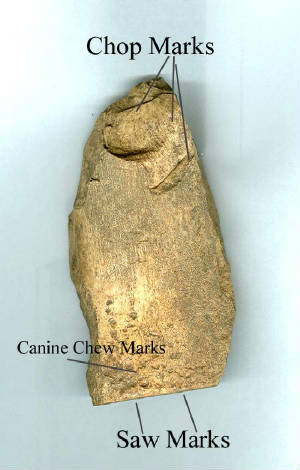 The presence of canine chew marks on the bone indicates that it was exposed and available to be chewed by a canine.